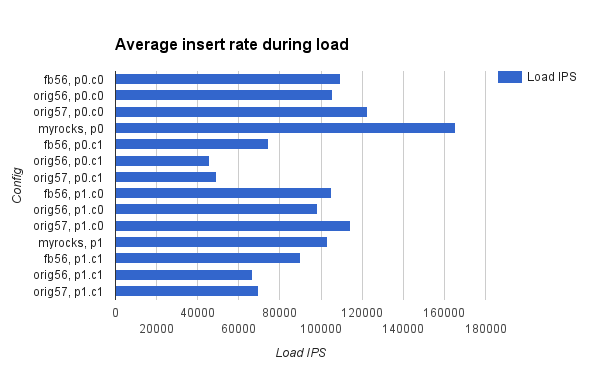 My first day with InnoDB transparent page compression didn't turn out OK, but I am an optimist so onto day 2. I gave up trying to use it on a host with CentOS 6.6, XFS and a 3.10.53 kernel. I had a bit more luck with a Fedora 19 host using XFS and a 3.14.27 kernel and I ran linkbench. You can follow along here or at bug 78277. I configured linkbench with maxid1=100M and the database was about 100GB after the load. I used MySQL 5.7.8 with transparent page compression. 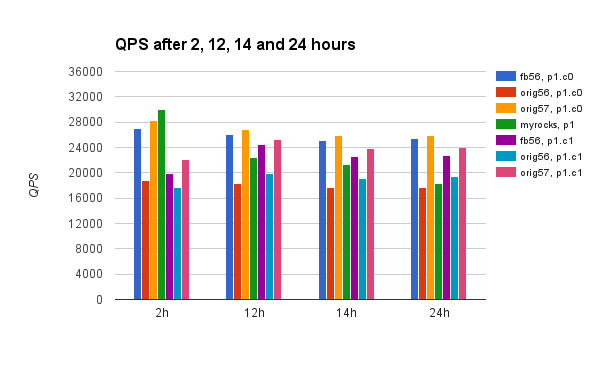 I won't share the performance results just yet, but at the and of 7 days of the query test I shutdown mysqld and my storage device (400G Intel s3700) had 180G free space. I confirmed that I was able to use at least 176 of the 180 GB, which was a good sign. However, the device was only able to write at ~60 MB/second while making copies of a 2G test file. File copies were writing at ~200 MB/second on a second host that has the same hardware, the same amount of free space, but didn't use hole-punch for compression. So this is one more cost of using hole-punch, it makes the filesystem much slower. But I don't blame XFS. I don't think that doing a hole-punch on every small write was the intended use for that feature. [Warning] InnoDB: Trying to close/delete/truncate tablespace 'linkdb/linktable' but there are 1 pending operations on it. Then it got more exciting -- a long semaphore wait courtesy of a slow unlink. Alas the DROP TABLE finished before the background thread killed mysqld.